A sports management and business administration major and former Red Raider tight end, Josh Hornstra looked forward to a career in the sports industry following graduation. 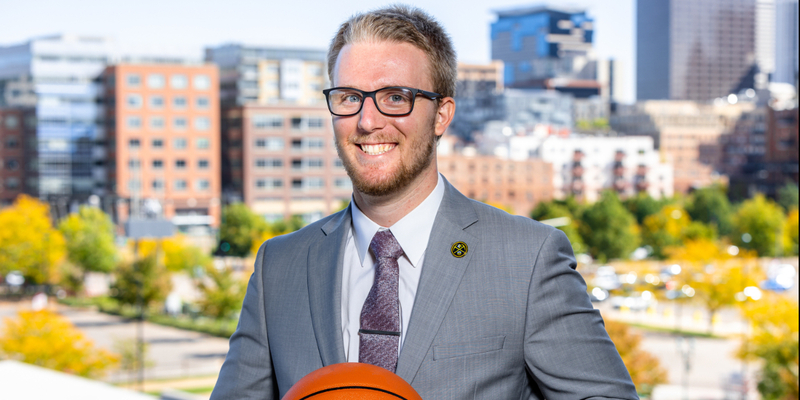 His time at Northwestern included opportunities to work at Super Bowl LII and intern with the Sioux Falls Skyforce; both were great practice for his current job with the Colorado Rapids, a Major League Soccer team based near Denver. What is your role with the Colorado Rapids, and how did you get it? My responsibility is to sell tickets to Rapids games. These tickets come in many different forms, such as single-game tickets, group tickets, full-season memberships and premium seating. During my senior year at NWC, the Career Development Center hosted an interview day. Among the companies represented, there was only one name on the list that intrigued me: Major League Soccer's National Sales Center. I was fortunate to get the job, and at the end of my training with the NSC, I received several job offers from different clubs. I chose to take the offer from the Colorado Rapids. How well did Northwestern prepare you for your current job? I honestly believe I wouldn't be where I am today without Northwestern. The challenging academics helped me grow and learn what it takes to be a professional in the industry. Being a member of the football team developed a mentality of working hard and taught me how to balance different priorities at the same time. What do you appreciate the most about your Northwestern experience? The relationships I formed there. I loved being able to walk across campus and always see a familiar face. That is certainly something I miss now that I live in Denver. Where do you hope your career goes in the next 5-10 years? Ideally, I would love to still be working in sports during the next 5-10 years. A role that I have set my sights on is to become a manager of a sales department. I’ve already had the privilege of having high-quality managers help me grow and develop as a young professional, and I would love to be in a leadership position where I can help others develop their careers. At Northwestern, we want to help students start to figure out who they want to be, not just what they want to do. Who do you want to be? First and foremost, I want to be a light for Christ; I want others to see Christ through my words and actions. I also want to be a leader and continue to grow in the skills necessary to lead in the workplace. Lastly, I want to be known as someone who gives his all and sets the standard for others.